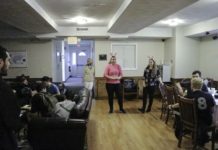 Through their work on the University of Rhode Island campus, police officers are able to communicate with students, often with the potential to create lasting relationships. The best part of the job has been the interactions and lasting relationships with the students, according to Officer Tom Guglielmetti. He said that he has been invited to two students weddings, one of which was a regular dinner guest of Guglielmetti and his wife when they lived across the street from the university. Living in that neighborhood, Guglielmetti said that the university felt like a second home for him and his family. They went to the same stores and saw many students often. Guglielmetti said that all three of his children, two sons and one daughter, graduated from URI. Guglielmetti went to the academy for the university in September of 1980 and started working as an officer that November. He said that he chose to work for a campus police department because he thought it would be challenging. Originally from Warwick, Rhode Island, Guglielmetti went to Bryant University for one semester, and majored in law enforcement. He said that he enjoyed taking courses and continued to expand his education at URI. His coursework included psychology, sociology and business. His favorite part of the courses was this interaction, since there was a lot of group work in the subjects he chose. Guglielmetti remembered that in some of his economics classes, he was tutored by some of the students. Guglielmetti said that very few of the students were wary of him in the classroom because the officers were in the community more during the ‘80s and ‘90s, “so you knew a lot of the kids.” He said that he feels the university is on their way back to being a close-knit community, attributing this positive trend to the officers the university has recently hired. However, he emphasized that it is also important to maintain a very professional relationship with students so they feel confident that the department is capable. The combination of this professionalism and the comfort level provided by the department’s familiarity can be very helpful for students, according to Guglielmetti.